My trip to Ecuador was easily one of the best experiences I’ve ever had, but since I was visiting that neck of the woods – EXCUSE THE PUN – it wouldn’t have been complete without visiting the Amazon rainforest. Did you know? Nearly two-thirds of the Amazon rainforest is found in Brazil, but it spans over Ecuador, Peru, Colombia, Venezuela, Bolivia, Guyana, Suriname and French Guiana too. Click here to watch the after-movie for my Ecuador adventure. I could waffle on for forever about my days in the jungle – so apologies in advance if it gets wordy – pour yourself a cup of tea and enjoy a breakdown of the best experience my overdraft is still compensating for. The journey to and from Ecuador was one of the longest I’ve done in my life – but it was DEFINITELY worth it. Having booked a cheap hotel for the night before, we woke up around 5am for an early flight from London and a mere twenty-something hours later, we touched tarmac in Quito. Once we were through security, a lovely VESA volunteer met us and we boarded the coach to Misahualli – a small town on the edge of the Amazon basin. The coach trip took roughly 5 hours, and took us through the winding ‘roads’ of Eastern Ecuador. Although I slept the majority of the journey, I was shaken awake a couple of times by the interesting driving – if you’re prone to car sickness I’d suggest taking some medication for this joyride. We arrived in Misahualli early Sunday morning, and the beds of Hostal Shaw were certainly inviting. We crashed and had a couple of hours sleep before waking up for breakfast and a day of acclimatisation in Misahualli. We woke up to heavy rain at around 10am, and after only a few hours sleep, we took the day slowly, exploring Misahualli before our trek into the jungle the following day. We found some great shops and cafes, and walked down to the small beach, where there were boats moored off the Rio Napo. Hold on to your valuables – the monkeys steal! If they do take anything, you can trade fruit for them back. Do not use the cash machines! Thankfully I didn’t, but some of the people who did found themselves mysteriously losing $500 in the weeks following. If you do need cash, take a taxi to nearby Tena. We also met the locals, who were all very friendly. The lads in our group played football with the kids, and we watched a football game in Diego’s with – what seemed like – the entire town. Vamos Ecuador! I loved staying in Misahualli, and apart from our small group on the tour, we didn’t really see any other tourists. After getting in an early breakfast, we were picked up by a taxi to be taken to where our jungle trek would begin. It was raining heavily, and had been for a few days so VESA provided us with waterproof ponchos, and the jungle guide warned us that we would be getting wet. Only now do I realise how much of an understatement that was. Within twenty steps from our drop-off point, our guide casually pulled his machete from his shorts and started hacking away at branches to make our path. There are no ‘public footpath’ signs or gravelled walkways – this hacking continued for over seven hours until we reached camp – welcome to the jungle. Clambering up and down hills, sliding through mud and stopping to admire the wildlife really was how I imagined the Amazon to be – it was especially funny to see the difference that 7 hours in the jungle can make on people who were once scared of bugs – by the time we got to camp, we were practically sweeping the tarantulas out of our way. VESA had also packed everyone a lunch, so we stopped a couple of times for sandwiches, drinks and snacks. In the end, a trek that was estimated to be around 6/7 hours ended up taking over 8 due to the conditions. Don’t get me wrong, I was MORE THAN RELIEVED by the time we reached our jungle camp, but I’m also glad we spent so long trekking and seeing the jungle. The sleeping cabins at our jungle camp. By the time we arrived at camp, we were all pretty exhausted. Luckily, there was a cooler full of cold drinks and a volleyball net. We spent the rest of the evening relaxing by the fire, and enjoying a meal cooked on camp (I think this is the right time to say that if you don’t like plantain, you might struggle in Ecuador). Then in the evening, we were visited by a local shaman (expert in jungle medicine and healing). He conducted a ceremony that banished the evil spirits from the jungle to ensure we all had a safe visit. Very interesting experience. After we had all been cleansed, we were ready for bed. Waking early again, we had breakfast at our camp before setting off on a tour of a local plantation. Our guide Fabio showed us the unique plants and fruits, as well as making us little crowns out of leaves – legend. Then after lunch we grabbed our swimmers and a beer, and headed for the river. VESA provided the tubes, and we all enjoyed a sunny afternoon floating down the Rio Napo. This was definitely a highlight of the trip – check out my after-movie for tubing clips! Last but not least, we took a night canoe ride down the river to try and spot the nocturnal wildlife. We saw caiman (small crocodiles) and water snakes which was very exciting. This was – hands down – my favourite day of the trip. Usual start: early alarm, breakfast, and onto the canoe. Today, the canoes took us to a local Kichwa community. We learnt more about their culture, brought gifts and played games with the children, and essentially got thrashed at football. It was so fun to spend some time with the children, especially seeing how excited they all were with the simple gifts we had brought them. We visited the community’s local school, which was a very eye-opening and reflective experience. I don’t want to get all mushy (I will save that for my blog post about volunteering) but it was very inspiring to see how happy they all were considering the school didn’t even have enough materials for everyone. Warning: they do have their favourites. You don’t need to spend a lot – all my gifts were from Poundland! We said our goodbyes, and hopped back on the canoe. For those who wanted, there was another tubing trip that afternoon – the river was slightly higher and a couple of people were tipped from their tubes! Seriously, so so so fun. As it was our final night in the jungle, after dinner we played some drinking games and had a fun evening by the fire. Then at some point, Fabio brought out the big guns: Amazon moonshine. I’m not entirely sure how safe this is, but they make the drink themselves from the jungle plants… Think tequila, mixed with vodka and nail varnish remover. I think the rest of the evening was fun? It was our final day in the jungle, and we boarded the canoes to travel roughly two hours downstream back to Misahualli. To break up the journey and use the most of our time, we made several pitstops. Our first stop was the Amazoonico Animal Rescue Centre. We got to see some fascinating jungle animals like puma, caiman, snakes and parrots (I also liked the jungle piggies) as well as the amazing work that the volunteers at Amazoonico do. Did you know? 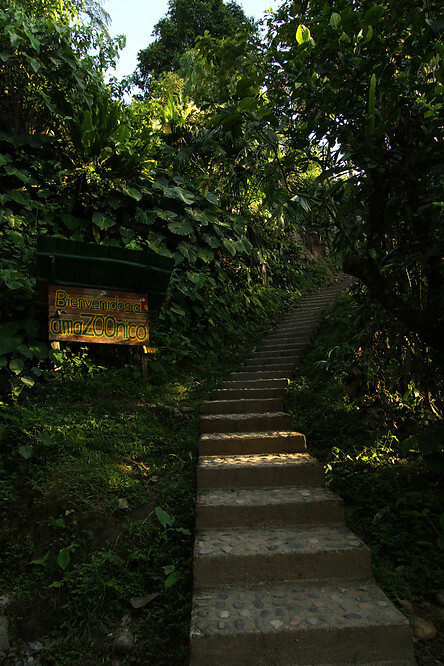 Ecuador is one of the top ten most biodiverse countries in the world – despite being smaller than Arizona. Most of the animals come from the illegal trade industry and rehabilitated before being reintroduced into the wild – a lot of the money from ticket sales goes towards this work. We also made a pitstop at another local community that made handmade pottery. We browsed their little shop, and stopped for some lunch too. I remember that it was very tasty – rice and chicken in a banana leaf (but at this point I was enjoying anything that wasn’t plantain). For the last leg of the journey, most people napped on the canoe or relaxed taking in the surroundings. With an action-packed few days, we were exhausted and ready for a decent night’s sleep! Travelling with a booked group tour seems your best bet. We met someone who was travelling South America solo, and he ended up joining our tour because he wanted to see the jungle – so it seems that the only way is with a guide. I could be wrong for other parts of the Amazon! Waterproof housing for my GoPro was a god send – as well as anything else valuable (phones, money etc) even when it’s not actually raining, the air is WET. AAAAAAAAND BREATHE. I have definitely missed out a lot of the details, but I have tried to keep it as ‘short’ as possible. For my time in Ecuador, I also spent a couple of days in Baños (read my weekend guide here) and a week volunteering with a local community – that you can read here! Hey there would you mind sharing which blog platform you’re using? I’m looking to start my own blog in the near future but I’m having a hard time deciding between BlogEngine/Wordpress/B2evolution and Drupal. The reason I ask is because your layout seems different then most blogs and I’m looking for something unique. P.S Sorry for getting off-topic but I had to ask!